It's a story you may not often have the chance to see - that of 'The Other Family'. When Claire became a part of Children's Hope China's Waiting Children Program. Two families fell in love with her. The second family, the Gours, will travel to make her their own in May... Although it may be that little Claire was meant to be a Gour all along. Discover how these two families became uniquely intertwined through their love for Claire, in Chelsea Gour's story in this month's E-news. Children's Hope Russia Program is flooded with travel arrangements and preparations, and many of our families have become practiced paperwork professionals as they update their documents. Shannon Frederick made her paperwork fun with a few photo ops in this month's Blog of the Month. Let's go fly a kite! Spring is here and April 4 begins a 3-day Tomb Sweeping holiday, celebrated in China and Vietnam. The holiday serves a dual purpose: honoring ancestors by attending to grave sites and flying kites during the day – and at night - to celebrate the season of new bounty. No matter which country is your child's first home - you can make your own kite to celebrate the day known as Qingming (China), Tết Thanh (Vietnam), Clear Brightness Festival or Spring Remembrance (English) - in the March Kids Corner. The Millers--MO China SN DOT 3/26/08 - New! Three-year-old Acer made his local paper when the state police helped him celebrate Easter. A dozen beeping eggs were the result – their sound leading Acer, who is visually impaired, to his hidden and hunted Easter eggs. 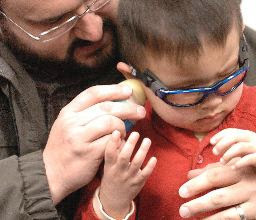 Acer Bowman was adopted from Children’s Hope – China Waiting Child Program by parents Bill and Heather of Michigan. “He’s a joy, but a joy salted with screeches and everything else!” says Heather. The couple is currently paperchasing for their second child, a daughter who also shares Acer’s special need. Acer's story is also in C&G News, here, and AdvisorSource, here. 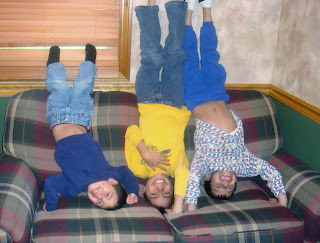 Are Three Boys a Handful? 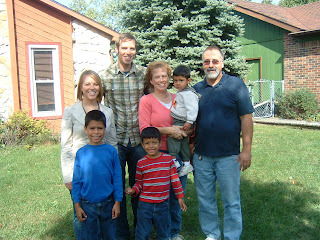 Karen and her husband Dan Baker added three Colombian brothers to make a family of seven. From handstands to smiles to backyard romps, the boys make the family complete. The Indianapolis Star gave an inside view of the Baker family workings. Find their article online at IndyStar.com. Pictured: The whole Baker Clan! 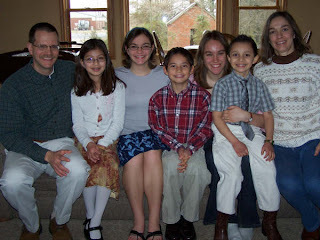 (L-R) Back row: Bethany, 20, Jonathan, 22, mom Karen, Andrew, 2, and dad Dan. Front row: Maicol, 8, Juan, 6. All Children's Hope International offices will be closed on Friday, March 21 for Good Friday. Children's Hope wishes you and your family a wonderful Easter holiday! 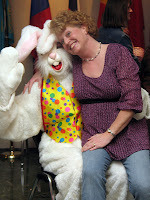 Pictured: A special Children's Hope Easter bunny and China's Waiting Child/Special Needs Program Specialist Leslie Broome wish you a happy holiday, too. • The Millers--MO China SN DOT 3/26/08 - New! The Hague Treaty on Intercountry Adoption establishes international standards to protect orphans and both their birth and adoptive parents. It aims to prevent child trafficking and other abuses. It also assures adoptive families they are working with an adoption agency that meets these ethical standards. As early as November 2006, Children’s Hope submitted our application for Hague Accreditation and in May 2007 we completed our self-study. We have been diligently pursuant of this standard ever since. When the Council on Accreditation (COA) published the first batch of Hague accredited agencies, Children’s Hope status was pending. On March 7, 2008, the COA reviewed Children's Hope International's Hague Accreditation case and cited on March 19 that additional evidence is needed to demonstrate our compliance with Hague standards. Our Hague accreditation status is therefore still pending. In the coming months, we will be pursuing our accreditation, working with all constituents involved in the timeliest manner possible. Additional evidence may be available as early as May 31. 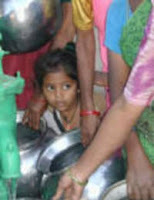 Children’s Hope International’s mission is to find homes, health and hope for children in need. This mission is directly in line with Hague standards, and we continually aspire to the highest ethical standing in our placement of children into their forever homes. We do not seek to meet the minimum standards for such an accreditation, we seek to surpass them. In late February, the CCAA held their second training session for the CCAA Online Information System for China adoptions, which is greatly speeding the matching of parents to children who are available for adoption and are also harder to place. The special needs of these children range from birthmarks or repaired cleft/lip palate to those children who are older or have more difficult medical diagnoses. Special needs children share one of the same needs as those children that are classified as "non-special needs" - they all need loving forever homes. Children's Hope is excited to have been a part of bringing this specialized computer training to Chinese orphanages, through the generosity of donor ASG Co. and Arthur and Carole Allen. 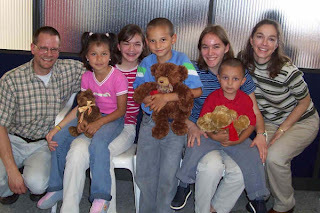 Tim and Judy Herrera of Missouri adopted three siblings from Colombia in February 2005. It is amazing how much Danny, Angie and Andres have changed. Even Lindsay (now 19) has changed quite a bit in 3 years! Danny (11 years old on March 1) has grown almost 6 inches and gained 11 pounds. He has lost all of his baby teeth and is working on his 12 year molars. Andres (8 on March 25) has grown almost 7 inches and gained 13 pounds. He has lost 8 teeth and grown 6 of them back, so far. He has learned to ride a bike and tie his shoes. Three years has brought a lot of changes for all 7 of us! It has been an adventure that God has been faithful to lead us on! There have been many surprises along the way, but we are so proud of our family as a whole and each member individually. Each of us has had to overcome and rise above many challenges - and we have! A photo of the three young Herreras, at the airport in 2005, graces the wall of Children's Hope headquarters in St. Louis. To a great family - congratulations on 3 years together! • The Bowman/Tomlinsons--MI China SN #2! Blogging about adoption is great! Not only can you connect with your family and friends, your fellow Children's Hope families, and those adopting from your child's birth country... You also have the opportunity to inspire prospective parents who are exploring international adoption as an option to build their own family. If you are thinking about starting a blog and are unsure where to begin, check out the new site - Adoption Blogging Tips and Tricks. Blogging guidelines for your country of adoption are published here online. You will also find reviews of different blogging platforms (like Blogger, Journey to Me, Wordpress, etc) which CHI families have personally used for their blogs. Do you want to see more blogging examples? Search through the CHI blogroll on this site's right sidebar to see what your own blog can look like. Before you know it, you'll be sharing the stresses of unexpected plane delays and filing for your I-600... and the emotional highs of your child first smiling up at you and the hiding of your first Easter eggs as a family, together. Once you have experience blogging, share your thoughts on your chosen blogging platform in the comments section, too. We are our best resource. Enjoy!